Berkley Square, a division of Berk Enterprises has formed a new alliance with Vegware Ltd., a global brand of award-winning eco disposables made from renewable or recycled materials. “Recognizing the need for greener packaging, Berk Enterprises launched their own Environ line of cutlery and table year many years ago, but with the growth in demand for green products, Berk realized it was time to launch an entire line of earth friendly products that were not only biodegradable, but also compostable, and therefor suitable for inclusion in food waste recycling,” said the company in a press release. “With so many states mandating composting and banning foam containers, we expect a 40-50% increase in the number of brokers and distributors who carry compostable packaging. And with Vegware, Berk is in the strongest possible position to provide sustainable compostable alternatives,” said Robert Berk, President of Berk Enterprises. 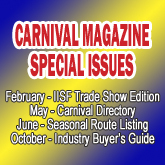 Speaking with Carnival Magazine in February, Joyce Brady of Playworld Amusements states that she and husband, Jeff, look forward to continuing on in the amusement business as independent ride operators. The carnival began the transition to their new role during 2013, selling some equipment and working with their fairs to bring in new providers. Playworld will maintain about 24 rides for certain fairs, such as the state fairs of Minnesota, Wisconsin, and Texas, as well as for corporate events. “We are very appreciative of the industry, but enjoy the new, relaxed pace,” says Joyce. Butler Amusement’s new KMG Freak Out premiered at this year’s Riverside County Fair and National Date Festival in Indio, California. This year’s event ran from February 14 through 23 and marked the 68th edition of the fair. In total, Butler Amusements provided 53 rides. The Freak Out originally set to be exhibited at the IISF Trade Show instead went directly to Indio because of extreme weather conditions across the U.S. Weather in Indio was picture perfect during the event, contributing to a total attendance figure of 294,864—up from last year’s 282,335. Congratulations to Elizabeth (Betty) Siefker of Showmen Supplies who is retiring from the company after nearly 50 years. She and her husband, Gene Siefker, founded Showmen Supplies in 1966. During her time at the family-owned corporation, Betty served as Executive Administrator. “It was Mrs. Siefker’s creativity and foresight that led to painting the Showmen Supplies trucks bright red, long before anyone saw red on the highways,” says the company. Today, Showmen Supplies is operated by her sons, Mark and Scott. A luncheon celebrating Betty’s career was held in La Porte, Indiana earlier this year. Also from OABA, the organization has welcomed two new members to their Hall of Fame. Guy Leavitt, owner of Ray Cammack Shows and the late Earl Butch Butler of Butler Amusements were inducted into the Hall of Fame this past February. The organization also recently installed their 2014, Chris Lopez of Ray Cammack Shows. In preparation for the 2014 season, Luehr’s Ideal Rides based in Belleville, Illinois has updated their Pharaoh’s Fury with a LED light package. The show has also added a new, Schantz Mfg. concession trailer offering ice cream. Powers Great American Midways is adding a KMG Inversion to their lineup in 2014. The show has also purchased an AP Spin Zone bumper cars unit. For a third consecutive year, the Fort Worth Stock Show saw attendance top the one million mark. Total attendance at this year’s show reached 1,137,100. The event ran from January 17 through February 8 with Talley Amusements providing the midway. The 2015 Fort Worth Stock Show will run from January 16 through February 7. Wade Shows welcomed a new attendance record of 1,740,154 at the San Antonio Stock Show and Rodeo. This year’s number surpassed the previous attendance record of 1,665,747, which was set in 2013. The event ran from February 6 through February 23. Modern Midways has purchased two new rides for the 2014 season. A Motorcycle Jump was acquired from Dalton Kid Rides as well as an A.R.M. Rock Star. Several units of North American Midway Entertainment will once again kicked-off their season at the Miami-Dade County Fair and Expo in March. The event runs from March 13 through 30 in Miami, Florida.